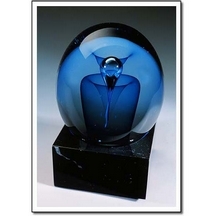 Beautiful Handblown Cobalt Fountain Orbit Inside Crystal. Every piece is handmade, and therefore may differ slightly in size and shape. Imprint Area: 3.00" x 1.5"